When it comes to winter, we love snow. It provides inspiration for so many fun kids winter crafts & activities. We also love heading out for plenty of snowball fights and sledding. Not only is sledding fun, but with each giggle and grin as the kids fly down the hills, there’s also an opportunity to talk about the science of sledding. 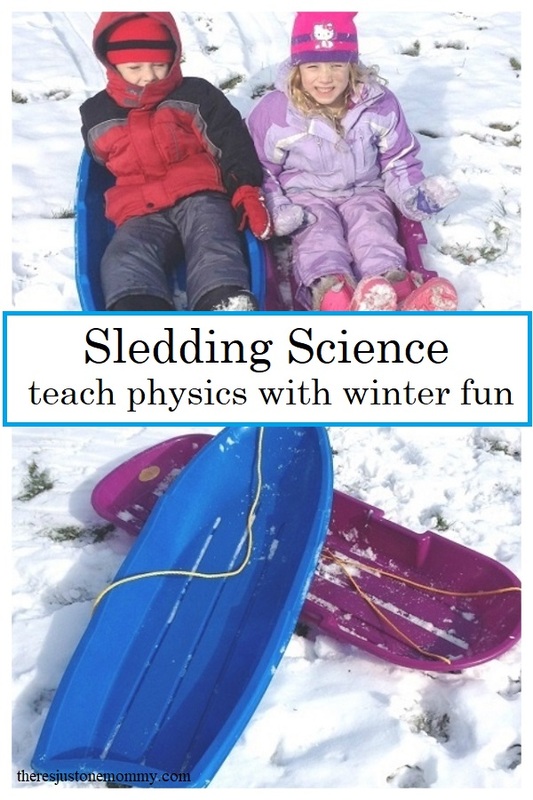 When it comes to winter science activities for kids, sledding provides so many fun ways to learn! Sledding is perfect for discussing energy. 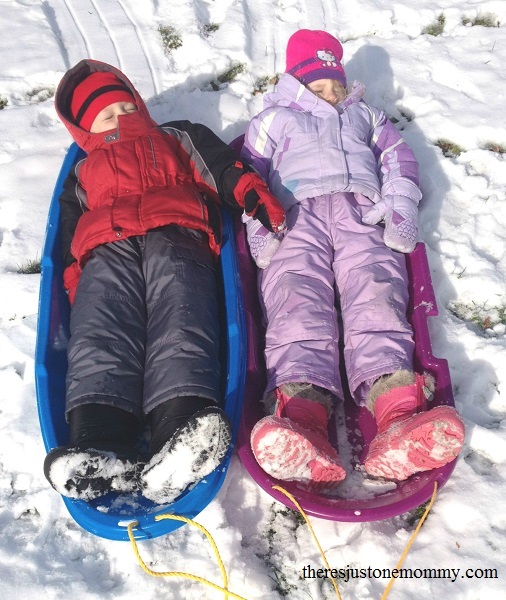 As your child sits on their sled at the top of the hill, they have potential energy. With a push it suddenly changes to kinetic energy as the sled starts to fly down hill. Sledding is also a wonderful opportunity to talk about Newton’s first law of motion. This simply states that an object at rest will stay at rest unless acted on by an outside force. This is easy for even very young kids to understand as they sit at the top of the hill, waiting patiently (or not so patiently) and not moving until mom or dad gives them that little push. I repeated Newton’s law several times for my children as they waited for that push on our last sledding excursion. By then end of the day they were quoting it right back to me. Newton’s first law also states an object in motion will stay in motion unless acted on by an outside force. We talked about how the grass poking up from the snow could also affect the sled. Which brings me to friction. Sledding is a perfect hands-on opportunity to talk about friction! They both noticed that the sled stopped faster if it ran over a lot of grass or the rope that was tied to the sled versus just running over the smooth snow. It wasn’t hard for them to figure out that the snow caused less friction than the grass. You could easily take it a step further and challenge older kids to try to find ways to further reduce friction on the sled. Could rubbing wax on the bottom of the sled help? After discussing energy and friction, challenge your child to come up with the best position to sit on the sled to make them go the fastest. Now they’re learning about wind resistance! This is another form of friction that occurs when sledding. 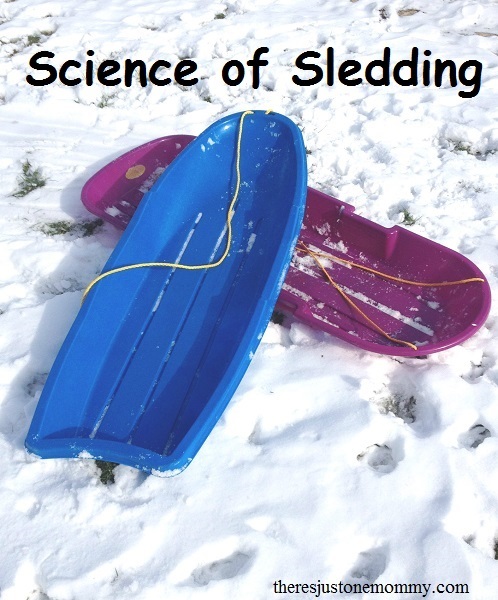 The next time you have snow, be sure to check out some of the science of sledding with the kids! I can’t wait to do something like this with my boys. We’re still working on the alphabet and potty training and such. We have thrown in gravity, but I don’t think they’ve got it just yet. Keep tossing “gravity” and other big ideas out there! It’s surprising what they can pick up at a young age.